We pay special attention to Assessment and Evaluation. We have brought a digital revolution in our school. Children at all levels are carefully monitored and assessed throughout the year. Each student moves through the school with Progress Charts and Report Cards, so that every receiving teacher is aware of his/her attainment levels, experience, progress rate and special needs. They indicate areas of work covered together with notes relating to strengths, special needs, talents, interests, communication skills, social skills, punctuality, attendance and other relevant information. 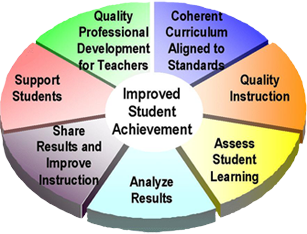 Continuous Comprehensive Evaluation is a continuous process of caring education where the teacher is a mere facilitator. The out come of this sort of evaluation makes the child believe in himself. He tries to grow with confident, sincere, punctual, fearless and there is no stagnation . The child faces the real problems of life ,in the atmosphere ,environment and child experiences. This practical aspect makes its more activity based . The basic objective being that the child should learn something new. Child is evaluated in his class work, homework, assignment, project which sensitise children to adapt to life skills and values.